MailClark is a communication solution which integrates with Slack and Microsoft Teams to allow users to manage and respond to all of their external email, Facebook, and Twitter communications from a single interface. Multiple inboxes can be set up in Teams or Slack for different accounts and purposes, such as sales or support, or multiple external accounts can be synchronized in a single inbox. With MailClark’s Gmail-Slack integration, users can control which emails are imported, and what information is synchronized, including sender names and signatures, sent emails, and read, archived, and deleted messages. MailClark supports both tweet and Direct Message (DM) responses from within Slack or Teams, and users can switch between message types as necessary. All messages are indexed and archived, providing team members with access to message histories and the ability to collaborate seamlessly on email or Twitter response threads. No need to check dozens of different email adresses everyday : everything is in slack, and manageable by everyone on our team. Possibility to exchange with non slack people through email, without leaving slack. Mailclark lets me get all my team's email directly in Slack, canceling the need to check multiple inboxes, multiple times per day. It makes us save time, and we really appreciate the possibility to do the same with Facebook Messages / Twitter accounts. Mailclark lets me get all my team's email directly in Slack, canceling the need to check multiple inboxes, multiple times per day. It makes us save time, and we really appreciate the possibility to do the same with Facebook Messages / Twitter accounts. I'd very much like to have a feature in which I could list all the conversations I've had with customers, partners that we deal with through Mailclark. For frequent conversations you can just leave a channel open, but for customer support it'd be great to be able to search for a contact and land directly in the slack channel dedicated to them, this way we'd have access to the chat history, etc. Would also very much like to be able to merge Facebook Messenger and Email channels when they're for the same customer. 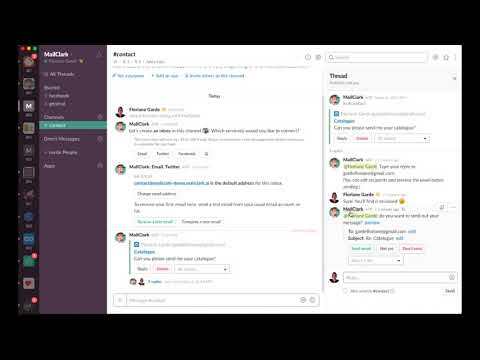 All communications in one channel : slack! I love the way the team handles support, kudos for that. Also love seeing the improvements coming along during the time we've been using it (most memorable are the intro of threaded replies, smtp support). And like I stated earlier, it just works. It does what you expect and is reliable doing so. I love the way the team handles support, kudos for that. Also love seeing the improvements coming along during the time we've been using it (most memorable are the intro of threaded replies, smtp support). And like I stated earlier, it just works. It does what you expect and is reliable doing so. Mailclark gets my clients who won't adopt slack, onto Slack. And that keeps me out of my inbox. I would say that I don't like the pricing - but they recently updated it - the only reason I don't upgrade to a paid version is that I don't have enough communication to justify it - but the price is reasonable for a service that is awesome. Streamlining email communication from remote chapters into one platform. I can access all email accounts from one location.It's been great using this software and seeing them listen to feedback and continue to add new features along the way. Their customer support team is able to help anytime I have a question. I look forward to continuing to use the software and helping them grow as well. It's been great using this software and seeing them listen to feedback and continue to add new features along the way. Their customer support team is able to help anytime I have a question. I look forward to continuing to use the software and helping them grow as well. Currently the only thing I'm waiting on is custom email signatures per inbox which I've suggested and talked to them about. Hi Jason, we¿ve taken good note of your feedback indeed. We¿ll keep you updated, thank you for your review! The product is easy to use, it has 100% success rate (no undelivered mail), also, there is no delay. Our client's send us work order through email, those work order related emails are automatically forwarded to a specific slack channel. That way emails from clients never get lost. Ease of use, no undelivered mail so far, no lag in delivery. Ease of use, no undelivered mail so far, no lag in delivery. Hi Moe, thank you for your feedback, this is really interesting since we¿re always looking to improve our pricing. If we make a change, you'll be among the first to know! Free for up to 100 messages per month. Pay per connector: $5/connector/month (billed monthly) or $3/connector/month (billed annually). Unlimited: $39/month (billed monthly) or $29/month (billed annually). Enterprise: $69/month (billed monthly) or $59/month (billed annually). Discounts are available for nonprofit organizations. With integration between Gmail and Slack, Mail Clark allows users to send, receive, reply to, and forward emails, delete messages, mark as spam, and synchronize their Gmail signature from within Slack, with customizable workflows to filter which messages are imported. A single unified inbox can be created, or users can setup multiple channels for different purposes, such as customer support, sales, and jobs. Twitter mentions and Direct Messages can be replied to directly from within Slack or Microsoft Teams, and tweets can imported into any Slack channel. As users can respond to emails, Facebook messages, and tweets directly from Microsoft Teams or Slack, colleagues have access to all original messages and responses. Below are some frequently asked questions for MailClark. Q. What type of pricing plans does MailClark offer? Q. Who are the typical users of MailClark? Q. What languages does MailClark support? Q. Does MailClark support mobile devices? Q. Does MailClark offer an API? No, MailClark does not have an API available. Q. What other apps does MailClark integrate with? Q. What level of support does MailClark offer?